After initially being announced back in 2009 as Metal Gear Solid: Rising, and rebranded in 2011 after facing cancellation, Metal Gear Rising: Revengeance looks like it's "gearing" up for its finishing lap before release with some new info (pardon the pun). Details on the chainsaw-wielding android canine, LQ-84i, have also been released. LQ-84i is described as an "Unmanned unit with learning AI and verbal interface." Apparently, LQ-84i is sent by Desperado Enforcement to kill Raiden. Though sentient, LQ-84i "must obey his orders or face deletion of his personality, and must fight Raiden against his will" because keeping an AI in check by threatening to delete it always seems to work out. Indeed, the end of the GamesCom trailer shows LQ-84i (my fingers are cramping up from typing that over and over) working together with Raiden. Though seemingly laden with plot and character clichés, Metal Gear Rising: Revengeace does look pretty spectacular from what information has so far been released. With the game losing its initial stealth mode and going straight into full-on action, hopefully the controls will be more user-friendly than the previous Metal Gear games. Plus, they've got a chainsaw-wielding android canine, which earns them extra points in my book. It's a robot dog with a friggin' chainsaw! 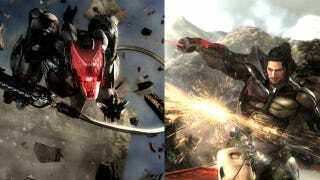 Metal Gear Rising: Revengeance is scheduled for release on February 21st, 2013.